Oxnard Salsa Festival 2011 , a set on Flickr. Follow evian_us to find out where the Evian Water truck will be around the Los Angeles area. The official Twitter account for evian for the United States. Follow us for evian exclusive event information and multimedia content. Score a chance to be a part of evian's new campaign at the Thrillist & evian® Live young® Studio -- an epic bash featuring delicious cocktails and a dance-tastic set from DJ/VJ duo Eclectic Method. Don your finest plain white t-shirt and get ready for your four frames of fame. The NAMM 2010 Show has conlcuded and there is lots of following up to do. The show ran from Jan 14-17. As a followup to last year. I visited the fine folks at DBZ Guitars/Diamond who had some models at their booth taking pictures with those in attendance. That's me in the center with the same girls, this time 3 of the 4 joined in the picture the 4th was out on lunch break. Anyone else get an email like this from Harry & David? We apologize for any inconvenience you experienced from this email, which was sent to you in error. We have corrected the source of the problem, and greatly appreciate you taking the time to contact us regarding it. onSale is an Internet discount retailer of computers, peripherals, software and consumer electronics to consumers and small businesses. onSale is a wholly-owned subsidiary of PC Mall, Inc. PC Mall, Inc. has been in business since 1987, has been a publically traded company since 1994 and is currently listed under MALL on NASDAQ Global Market. In 2007 PC Mall, Inc. had annual sales of $1.2 billion Don’t just buy it, get it onSale! onSale Carries Over 125,000 Products We offer over 125,000 unique products and we are top tier strategic partner of the world’s leading brands, including Apple, Asus, Belkin, Canon, Cisco, Garmin, HP, Logitech, Magellan, Microsoft, Nokia, Lenovo, Samsung, Sony, TomTom, Toshiba & Western Digital onSale Has Exclusive Deals Our close relationships with a myriad of companies in the computer and consumer electronics industry allow us to negotiate incredible exclusive deals and pricing on hundreds of products. We pass these deals with special prices, rebate savings, instant discounts, free bonuses and exclusive bundles you won’t find anywhere else! onSale Has The Best Overall Value We continually strive to provide the lowest product prices, the best promotions and inexpensive shipping options, so you know that when you shop at onSale, you’re always getting a great deal! onSale – iPods With Free Engraving Services We’re the only Internet discount retailer that offers FREE engraving for your iPod. 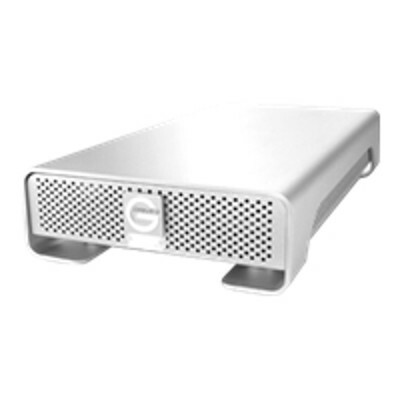 G-DRIVE high-speed interface external storage systems offer the ultimate in flexibility by providing 3Gbit eSATA, FireWire 800 (FireWire 400 via included cable) and USB 2.0 ports. G-DRIVE is the perfect high-performance solution for storage intensive applications including audio/video editing, digital photography, MP3 libraries and high-speed data backup. The system features a fan-less cooling system and the latest technology 7200 RPM SATA II hard drives with up to 1TB in storage capacity with up to 32 MB of cache. Easy to Setup – Time Machine Ready! G-DRIVE is formatted at the factory HFS+ with Journaling and is Time Machine Ready right out of the box! A simple initialization is all it takes to prepare G-DRIVE for use with Windows systems! Mac OS X and Windows compatible – Time Machine Ready! Note, you may cancel your subscribe & save subscription any time after you place your order. Hi there, you're part of a beta group receiving this feature, which means you may start seeing retweets in a new way. People who don't have this yet will see your retweets prefaced by "RT". VEVO Launches Evening of Dec 8! We are excited to tell you that VEVO will launch the evening of Tuesday, December 8!! We've been working night and day for months to bring you the best music video and entertainment experience we can dream up, and in just about 3 weeks you can see it online for yourself! In the meantime, please keep in touch and let us know what you think about all things VEVO! Mindshare / Wednesday 18th November, Venue + Program Announced! We're excited to announce the program for next Thursday at the Downtown Independent theater! NOTE: We've included upcoming events and special links at the bottom of this email. Off Silk Roadin': A Rally Across Eurasia! There will be a cash bar, snacks, music and of course a number of installations on display from the great brains from Mindshare Labs! We hope to see you there for another night of Enlightened Debauchery! We'll be trying a new rideshare system this month.. Just indicate your interest when registering. Mindshare draws dynamic people for an evening of fresh interactions. Hosted by a cadre of aspiring entrepreneurs, the evening consists of brief presentations and performances in a lush atmosphere. Light snacks and drink are provided, the music goes until 1am. Learn more about Terracide at their Hothouse Studios artist profile page here. Every month a winner is drawn from our FRC barrel. So not only do you get a free rehearsal by being part of the Frequent Rehearsal Program but you get another chance to win cash, prizes, tickets and much much more. For more details on all our monthly giveaways go to our Contest and Promotions page. Learn more here. Watch Richard Morales and Melinda Martinez as they pick the U2 ticket winners here Hothouse Studio Rehearsal TV.